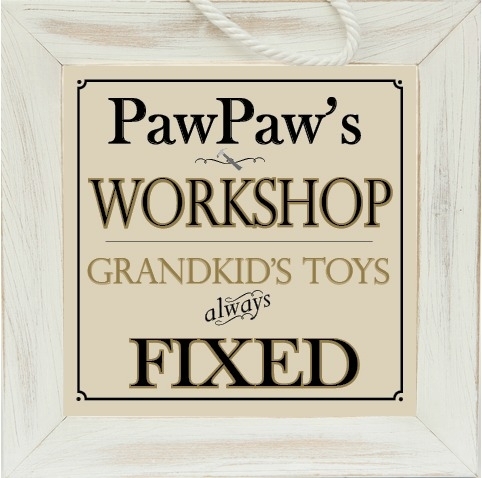 A perfect gift for the grandpa who grandkids rely on to fix toys. Grandpa knows that so much more is fixed when a beloved toy is mended. 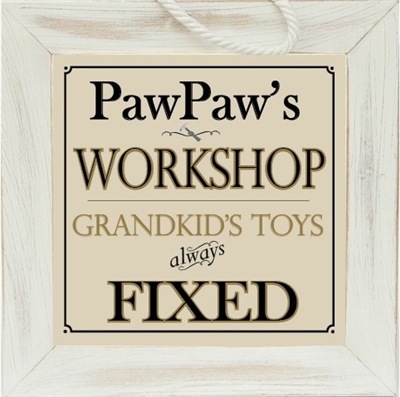 Give the grandpa who loves his grandkids a personalized workshop sign for him. Our 8x8 distressed white frame can be personalized with your grandpa name, whether you are looking for a gift for Papa or a gift for Paw, we can create it. This sign, made in the USA is suitable for wall hanging with roping or for table display. Celebrate grandpa's workshop! Personalized item arrived in excellent condition and very well made. beautiful. But when ordering would be nice if it was just a bit more clear about what on the item was going to be personalized. But my assumptions were right and I love it.